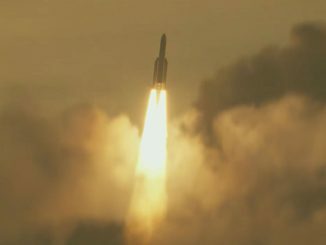 The Ariane 5 rocket’s weekend launch from French Guiana set a weight record and produced stunning imagery as the powerful 180-foot-tall booster soared into space backdropped by the colorful orange hues of sunset on the edge of the Amazon jungle. 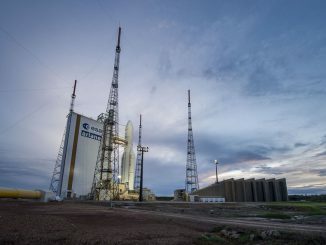 An Ariane 5 rocket is counting down to a second launch attempt Saturday to carry two communications satellites into space for DISH Network and Indonesian banking customers, taking the heaviest payload ever launched into geostationary transfer orbit. 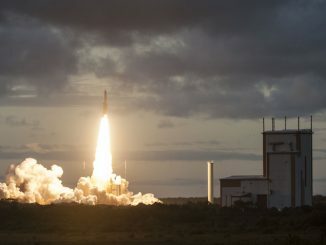 A European Ariane 5 rocket will propel two communications satellites from a standstill to a speed of nearly 21,000 mph in 25 minutes during a launch Friday from French Guiana. 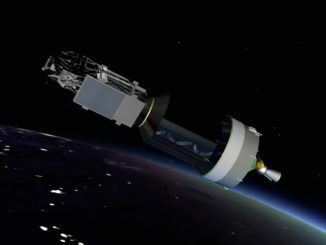 Two communications satellites built in California launched Saturday aboard the third Ariane 5 flight of the year after unacceptable upper level winds kept the rocket grounded Friday. 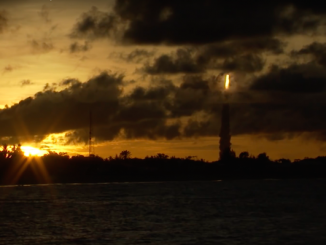 The European rocket lifted off from French Guiana at 2138 GMT (5:38 p.m. EDT) with payloads for DISH Network and BRI, a major Indonesian bank. 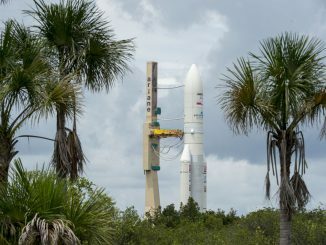 The third Ariane 5 flight of the year is on track for a late afternoon liftoff Thursday from French Guiana with two U.S.-built communications satellites to broadcast television channels to millions of DISH Network subscribers and improve banking services across the islands of Indonesia. 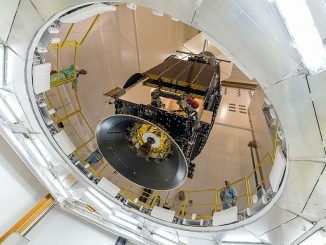 A new communications satellite to beam television channels to millions of DISH Network subscribers in the United States and the first spacecraft dedicated to support banking services have been attached to an Ariane 5 rocket for liftoff June 8 from French Guiana.